This is hilarious viewing, in fairness. 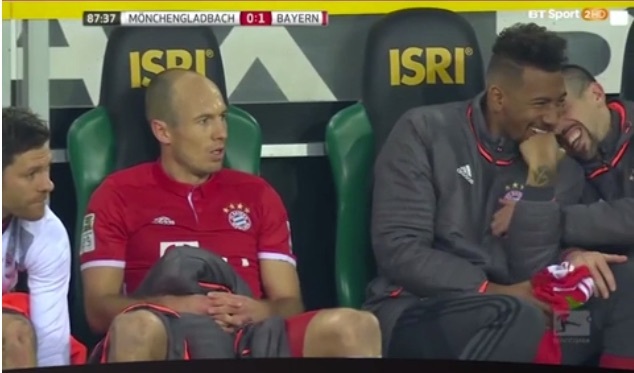 Bayern Munich beat Borussia Monchengaldbach at the weekend, but Arjen Robben kicked up a right fuss in the 88th minute when he was subbed off. He aggressively slapped Renato Sanches’s hand and sat glumly on the bench, while Xabi Alonso, Rafinha, Franck Ribery and Jerome Boateng wet themselves laughing. Alonso, who’s retiring in the summer, was sat next to Robben so had to stifle his laughter, but doesn’t do a very good job of it! Poor ol’ Robben, eh? He’ll pay for this today at training, we feel!